Global management consulting firm Avasant hosted its signature event, Empowering Beyond Symposium, at the National Union Building, Washington DC on October 30th. Sponsored by Hexaware and Uipath, the event featured industry executives and thought leaders firms such as Bristol Myers-Squibb, US Small Business Administration, the National Council on Aging, and LexisNexis. Over 100 senior executives from major financial institutions, NGOs, and donor firms attended this enterprise executive invitation-only event. How should companies develop a transformation roadmap to avoid getting disrupted in the Digital Age? How are digital technologies such as Automation/RPA, AI and Blockchain impacting enterprises and what is the best way to leverage them to drive transformation? How can organizations partner with technology and services firms to implement these transformation initiatives? Following the opening keynote was a thought leadership panel discussion with executives from the National Council on Aging, Bristol-Myers Squibb, Hexaware and Dallas Fort Worth International Airport to discuss leveraging automation, artificial intelligence, and blockchain in the transformation journey. A fireside chat, hosted by Anupam Govil (Partner, Avasant, President, AvaSense™), allowed Ajay Jindal, Senior Director, RPA, Continuous Improvement and Quality, LexisNexis and Joseph Santamorena, Vice President, Sales, Northeast Region, UiPath to share their insights based on their experiences scaling automation across a global organization. Keynote speakers, Sanjay Gupta, CTO, US Small Business Administration and Naresh Lachmandas, Former CIO, L3 CSW, spoke about innovation and disruption in the digital age and the role of the new CIO therein. 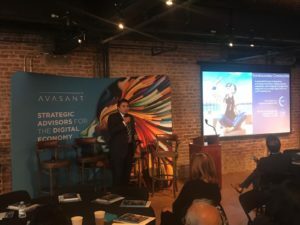 This thought leadership event was part of Avasant’s Empowering Beyond series, intended to be a forum for a broad spectrum of technology leaders around the world to examine technology trends, social impact, and opportunities for economic growth. The event was sponsored by Hexaware and UiPath.